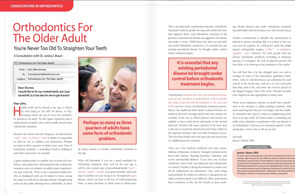 Although orthodontics is most often the best way to correct crowded teeth, it is not the only way. Less expensive and less time- consuming methods may be used if the problem is not too severe. Although the teeth may not be in perfect alignment, creating the illusion that they are may allow you to achieve your esthetic goal. Crowded or crooked teeth may require a combination of techniques described below. Your ideal treatment, for example, may include orthodontics to reposition the teeth followed by bonding, veneers, or crowns to improve esthetics. The choice of treatment ultimately depends upon your commitment of time and money, as well as your dental and esthetic needs. Cosmetic contouring is a simple and painless reshaping procedure in which tooth structure is contoured with finely ground diamonds. It's used to improve the appearance of the teeth by giving the illusion of uniformity and alignment. health of the teeth, as well as the proper distribution of pressure during normal oral functioning, is to be maintained. The thickness of the tooth enamel must be checked, the removal of too much enamel can expose the dentin, resulting in discoloration and possibly sensitivity. A conflict may arise between maintaining optimum function and achieving maximum esthetics. In these cases, the final decision should be based on a trade-off among esthetics, the degree of bite change, and the health of the teeth. A plaster cast may be constructed so that you can see the limitations in your particular case. Cosmetic contouring should not be performed on children's teeth. It can cause slight sensitivity not only during the procedure, but afterward because they have a larger amount of sensitive pulp tissue. If cosmetic contouring alone cannot shape up your smile, it can be combined with composite resin bonding to "build out" the fronts or backs of the teeth to fall in line with neighboring teeth. The result is an illusion of straightness that can be quite pleasing. 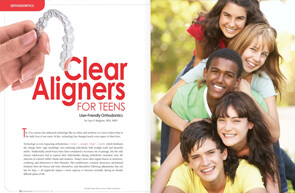 Orthodontics is the treatment of choice when the top priority is keeping the teeth natural and unaltered. 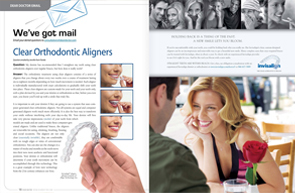 It is, without a doubt, the best way to correct malpositioned or crooked teeth. With orthodontic treatment, the teeth eventually will become aligned proportionally, making it your safest bet for a long-lasting, economical, and esthetic solution. 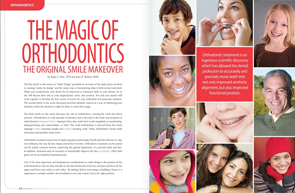 In years past, orthodontics was shunned by many adults because treatment was lengthy, and traditional metal braces were conspicuous and unattractive. Now dentistry has seen the advent of tooth-colored brackets, lingual ("behind the teeth') braces, and removable appliances. 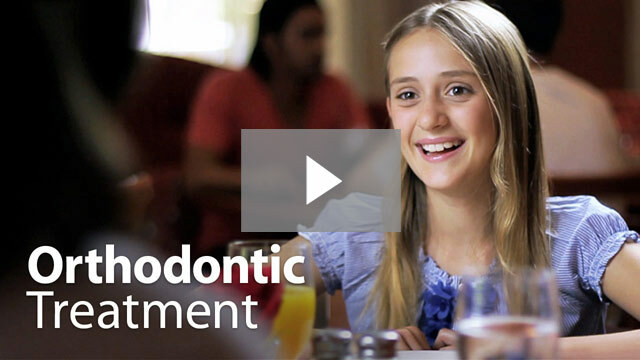 The newest orthodontic treatment is invisible braces (such as invisalign), a series of clear, removable, transparent matrices that are changed every 2 weeks. Each matrix moves the teeth to a specific position according to the custom computerized plan until the ideal placement is achieved. Most minor crowding can be corrected in 4 to 12 months, while more complex problems can be resolved in 18 to 30 months. However, compliance in wearing the appliance approximately 22 hours a day is mandatory. Invisible braces are easy to maintain with proper home hygiene and require less time in the dentist's chair since there are no wires or brackets to replace, making them a great option for adults. An added benefit is that, if advised by your dentist, you can place bleaching gel inside the matrices and bleach your teeth at the same time you are straightening them. Occasionally, the orthodontist may recommend that a tooth or teeth be extracted prior to realigning the teeth to make space, particularly in case where crowding is causing bone loss between the teeth. In many cases, porcelain veneers can also provide a reasonable compromise when you want to avoid orthodontic treatment. Crooked and crowded teeth laminated with porcelain veneers will usually give the result of a polished, natural looking smile. Crowns are another way to correct teeth. Although they may be more costly and time-consuming than most of the previously discussed cosmetic procedures, they can produce a more dramatic change and may be a preferable alternative, particularly when teeth are erupting, damaged, or receding at extreme angles from the root structure. If you think you may want to crown your crooked teeth, it's wise to spend a little extra money for a wax-up or trial smile. This will allow you to see the intended result before your natural teeth are prepared. You can make a serious mistake by crowning crooked teeth and thinking they will look terrific. You may not be happy with the result since the final crowns may be much thinner than your own teeth. In such cases, you will not only have lost the money spent on crowns, but you will probably end up undergoing the treatment you should have gotten in the first place-orthodontics. Crowns have limited use for crowded and crooked teeth because the orientation of the teeth to be crowned must be aligned with the surrounding teeth. If they aren't, the crowns won't be able to compensate for the difference. In other words, the same problem that existed with the natural teeth may also exist with the crowns. Tooth size is another major factor to consider because each tooth needs to be- or at least appear to be proportional. The more teeth that are treated, the less obvious any distortions will be. If only one or two teeth are crowned, however, there may be a noticeable difference between the crowned teeth and the natural ones, depending on the space involved. Careful cosmeticcontouring of both the teeth to be crowned and the adjacent teeth may make the final result appear more harmonious in size.